Faraway Press: The Online Home of John Jackson Miller: KOTOR Labor Pains, other Star Wars short stories again available! KOTOR Labor Pains, other Star Wars short stories again available! Today sees the release of Pablo Hidalgo's excellent Star Wars: The Essential Reader's Companion from Random House/Del Rey. It's a massive tome which starts a long time ago with a certain group of location-challenged Sith and goes on from there, covering all the Star Wars fiction in print. And now, some of that fiction is back in print, thanks to Del Rey, on its Suvudu site — including my very first Star Wars prose! Star Wars: Labor Pains is a Knights of the Old Republic story that I had originally conceived of as a story for Star Wars Insider; Pablo bought the story for the Hyperspace service on StarWars.com instead. Set between issues #12-13 (or Volumes 2 and 3), it's told from Gryph's point of view and remains one of my favorites. Read the story here — and then check out my notes on the story here. My second story originally for Hyperspace, Star Wars: Interference, is an offbeat tale of a dialogue between — believe it or not — Gryph (and at one point, his brother) and Ko Sornell, from Knights of the Old Republic - War. Only neither knows it at the time, and neither did the readers of this story back when it was released almost exactly four years ago. It's a fun little tale of wartime propaganda — falling on really deaf ears. The coda to the Knights of the Old Republic comics series — The Secret Journal of Doctor Demagol tells you what was going on behind the mask at a lot of different moments in the series. Major spoiler warnings are obviously in order. Read the story here. And finally, some endnotes are now available on it here. 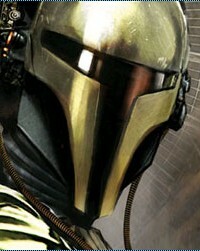 Star Wars: Knight Errant - Influx is the prequel story to Knight Errant: Aflame, and it appeared just before the release of the first issue of the comics series. Read the story here — and then check out my notes for the story, posted for the first time, here. And with Daniel Wallace and Jason Fry, I did a Knight Errant Essential Atlas Gazetteer, detailing some of what was to be found in the Grumani sector in the voice of Kerra's teacher, Vannar Treece. The text is now online again (though not the maps, yet). Read the piece here. The version with maps can still be found on StarWars.com here. And when you're done, you can check out my notes on the piece here, just written. Speaking of Daniel, I'll be appearing with him and Troy Denning this Saturday for Star Wars Reads Day in the Twin Cities. We'll be at the Barnes & Noble in Roseville, Minn., at 2 p.m. See you there! UPDATE #4! The production notes for Influx, the Atlas Update, and the Secret Journal have been added, at long last — and Interference has been posted. My new hardcover for 2013: Star Wars: Kenobi!